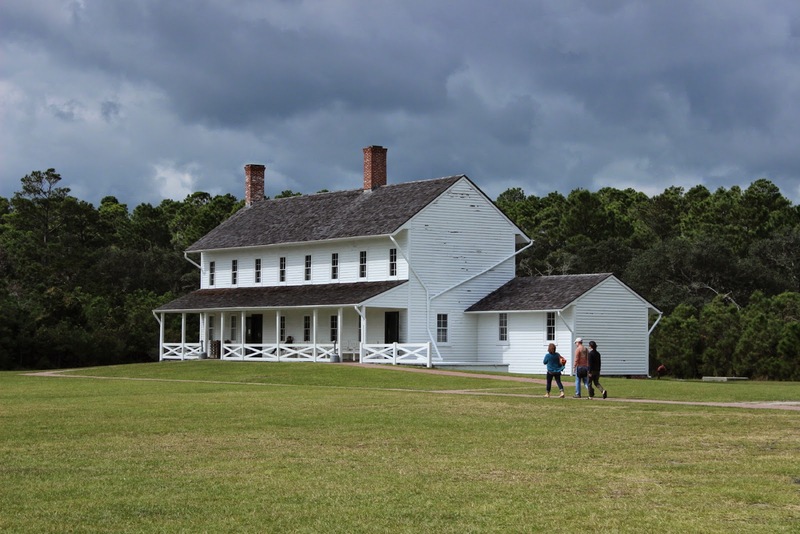 The Assateague Island National Seashore had a great visitor's center and helpful rangers to answer our questions. 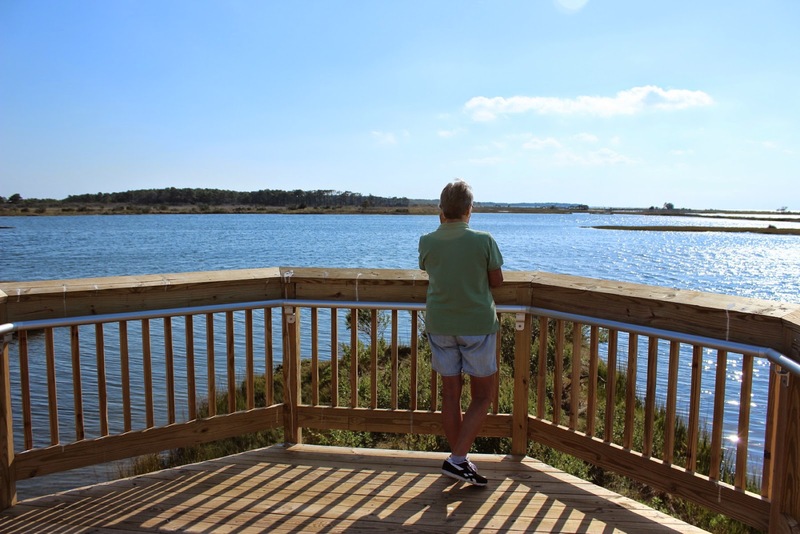 Jan and I really enjoyed our short visit to Chincoteague which is the lower end of Assateague Island. We stopped at the Bateman Center which is run by the National Wildlife Refuge. Assateague is in Maryland and Chincoteague is in Virginia. The center had some great displays. 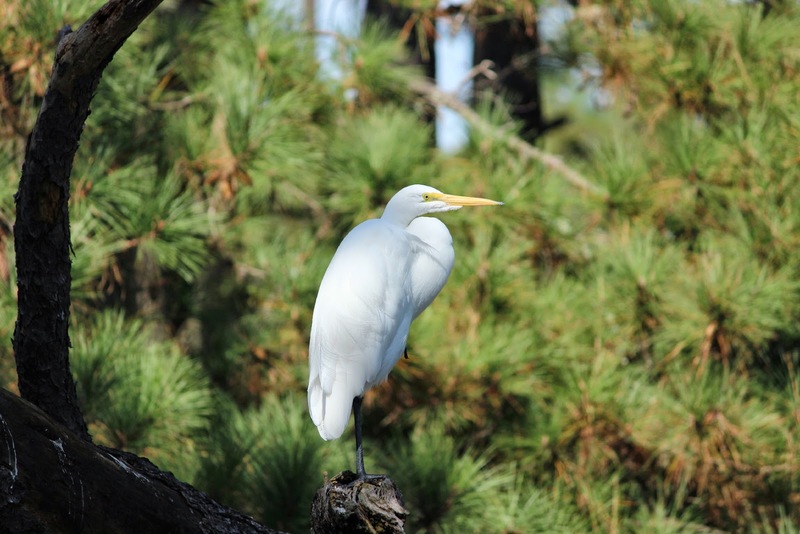 Along the road to the beach were some egrets waiting for their pictures to be taken. This one obliged us by displaying his just caught fish. What was even more fun was watching him swallow the fish. They manage to flip the fish 90 degrees to swallow head first. 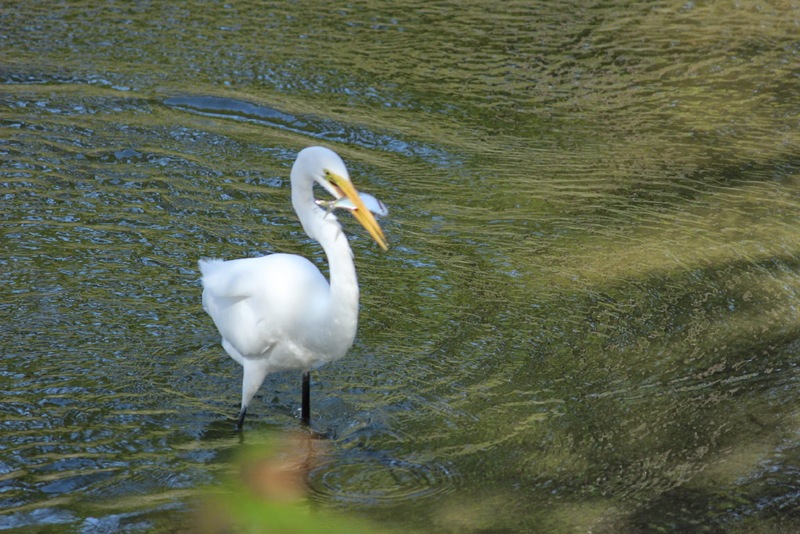 Then you can watch the progress of the fish down that long, long throat. This area is a large stopover spot for migrating birds. 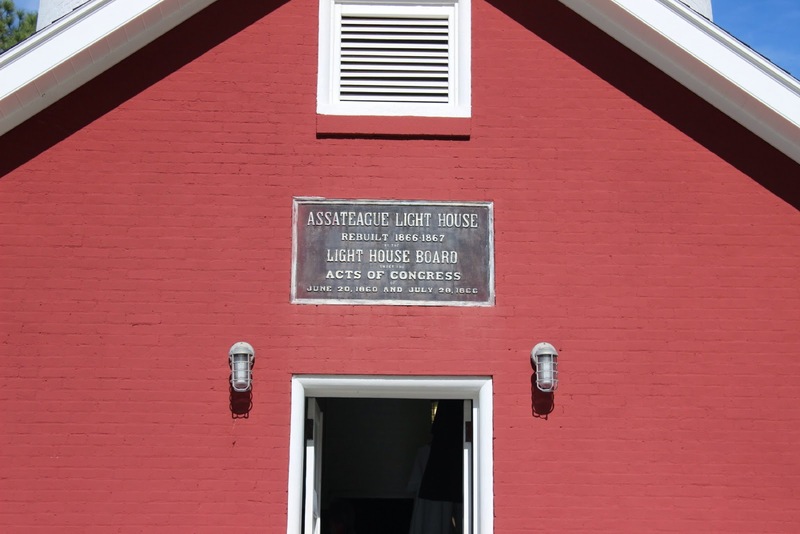 The Assoteague Lighthouse is close to the Bateman Center and the Beach. Jan and I are keeping Chincoteague on our list. There are some nice bike paths and lots of birdwatching and beach area. The lighthouses are a popular visiting spot for tourists all year round. 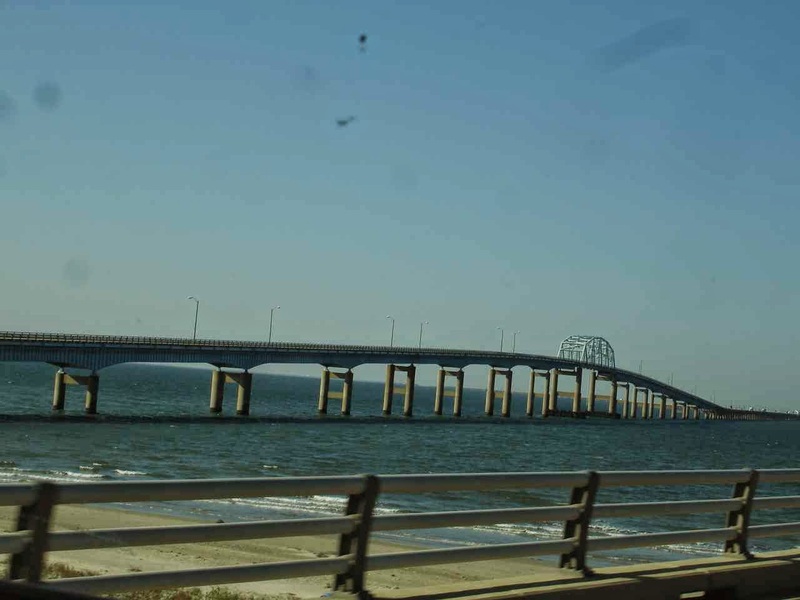 Way back in time, we remember a trip with busses down a very quiet Route 13 in Virginia to the Chesapeake Bay Bridge Tunnel. A 20 mile expanse of bridges and two tunnels to cut across to Virginia Beach and avoid the traffic of Baltimore and Washington, D.C.
At times , you might see the large Navy ships crossing to go to Newport News, but not today. A very reasonable ride around Norfolk and Virginia Beach leads us to Route 13 and Route 168 south to the Outer Banks and North Carolina. 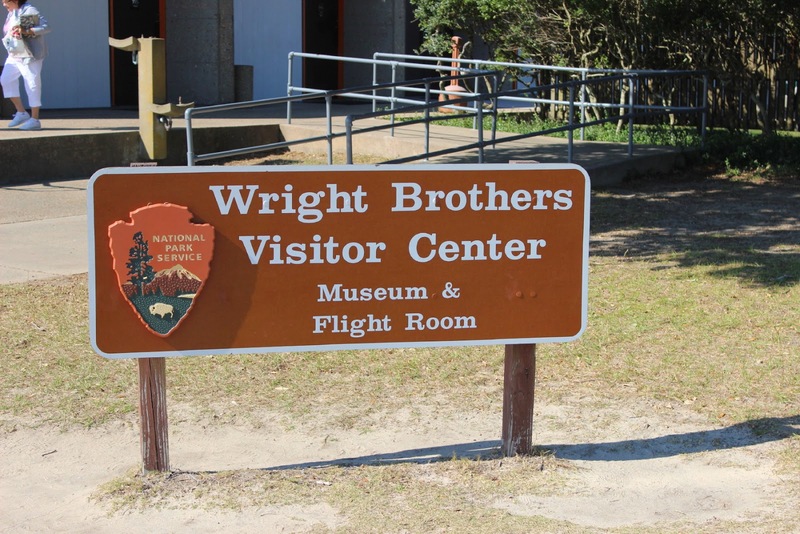 One of the first stops was at Kitty Hawk and the Wright Brothers National Park. 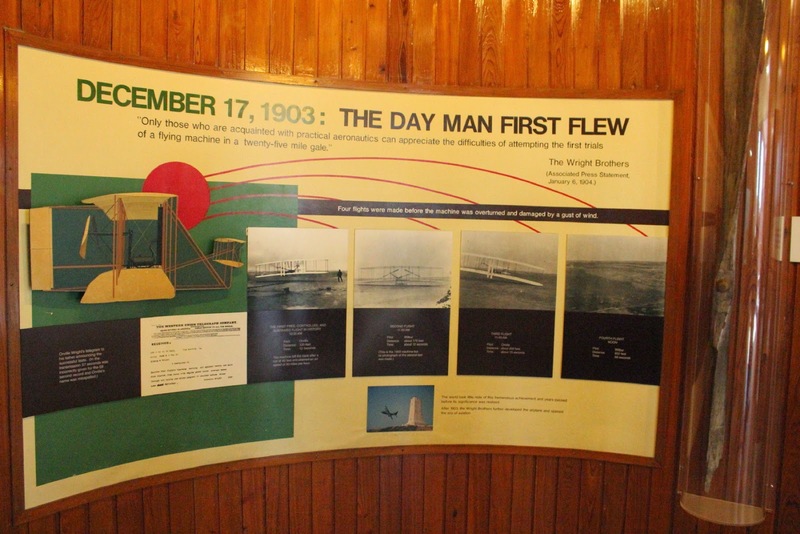 December 17, 1903, the first flight of man. Only 12 years before Grampa Maggs was born!! 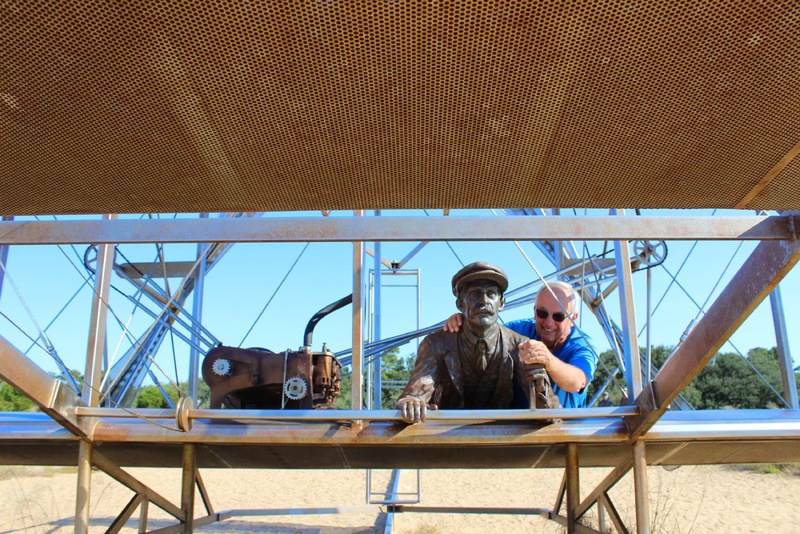 We were impressed by the research and applied engineering knowledge of the brothers, especially Orville. 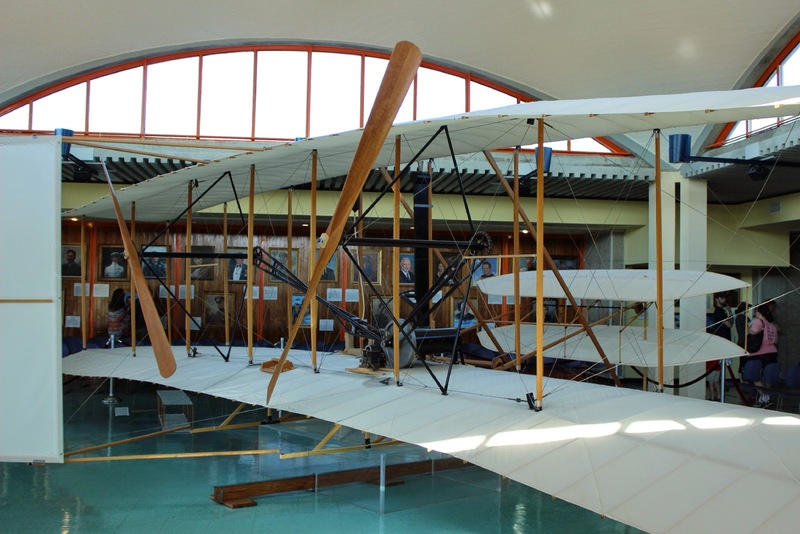 The museum has full scale reproductions of the first gliders of the Wright brothers and then also this full sized reproduction of the first plane. Bruce thought he just had to help Orville with the wing controls for a successful flight!! Kitty Hawk gave the Wright brothers the perfect open spot with reasonable winds to test the many designs for the wings of their gliders and the plane. 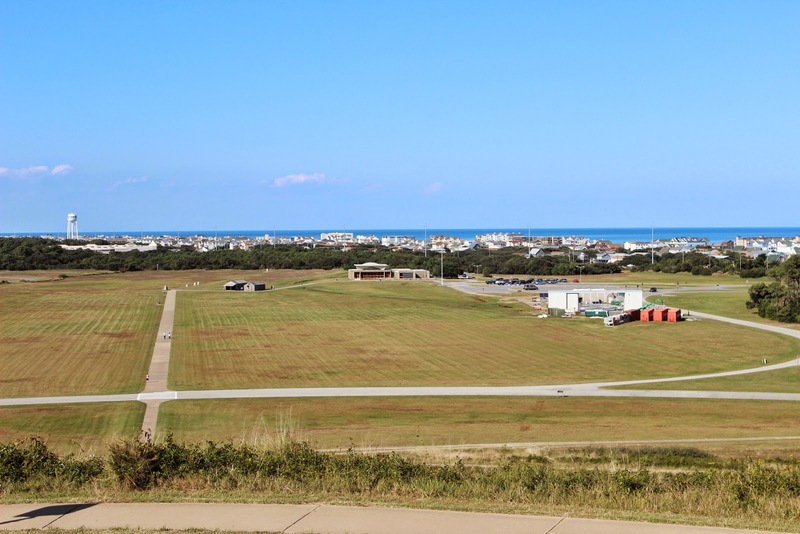 The gliders were launched from this hill called Kill Devil Hills, but the motorized plane was launched from the lower level surface with help from a rail launcher. 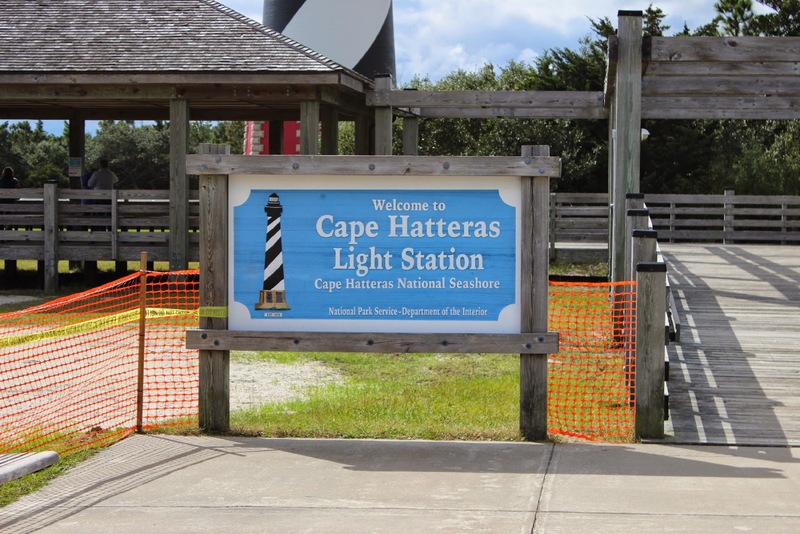 What a nice campground at Camp Hatteras in Wave, North Carolina. 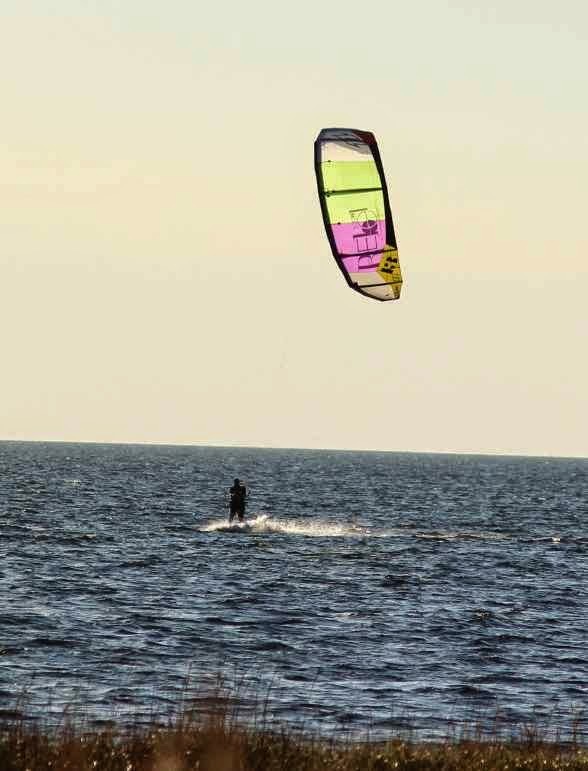 This picture of one of about 30 kite boarders was right from our campsite. A weather front was moving in and the winds were gusting from the 20's to 30 or more mph. Not only a front row seat for the kite boarders, but also a great view for the sunset. One of those sunsets that you just have to watch sizzle into the water. 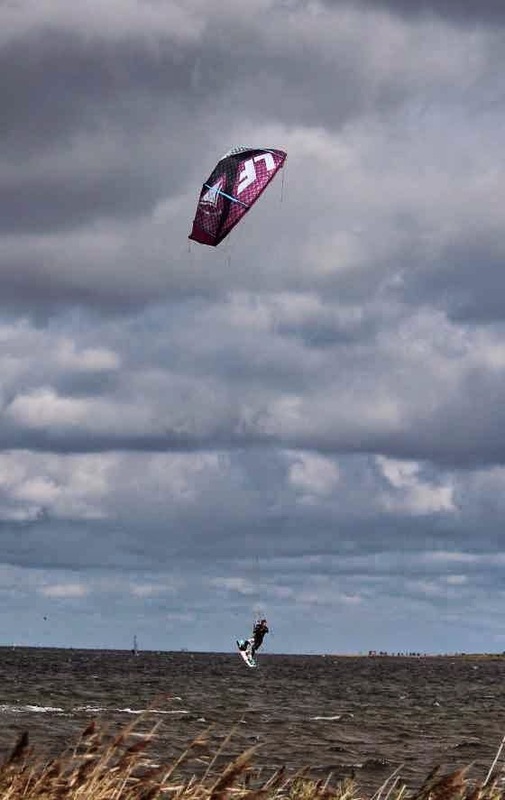 We had mentioned about 30 kite boarders? Of all of those, only 2 were able to get air time on their corners or jumping over waves. This boarder is at least 10 feet above the water. Sometimes he was able to get even higher. 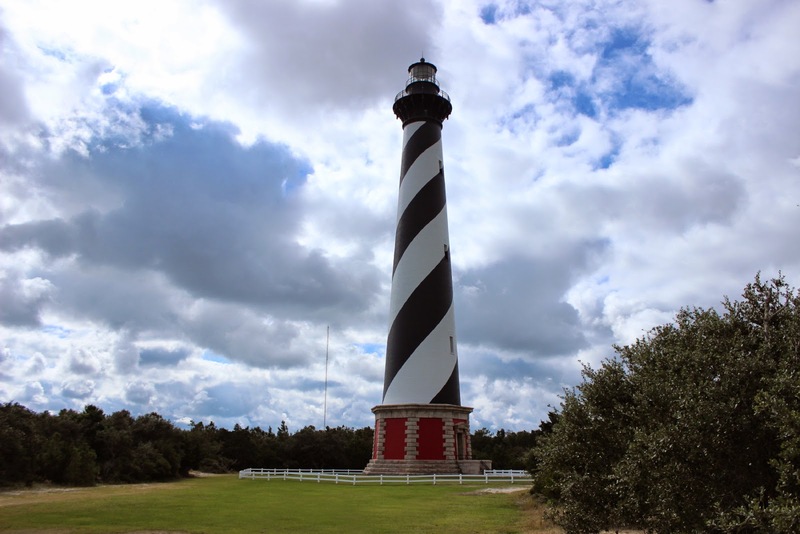 From our campground, Jan and I did a nice drive all the way down to Hatteras Village. To go further would have meant taking a ferry over to Ocracoke. This is the tallest brick lighthouse in North America. Like our Highland Light in Truro, Mass., this lighthouse was moved back from the beach in 1999. 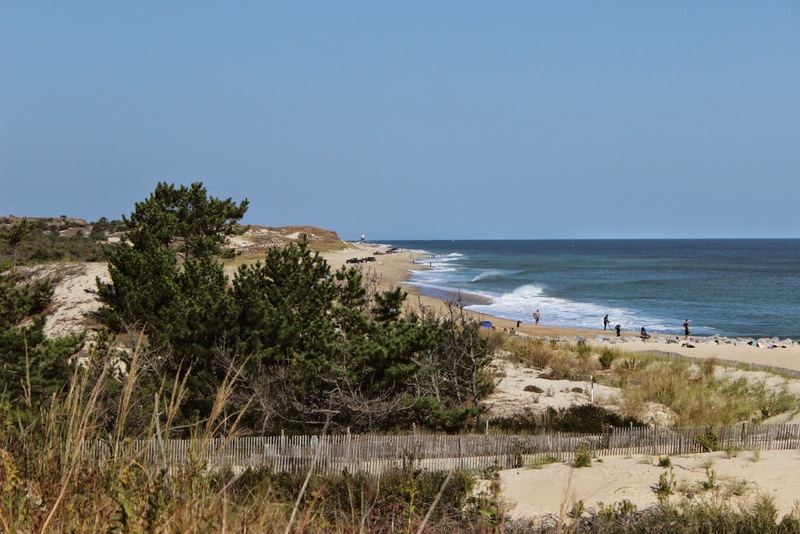 The Outer Banks are constantly changing with erosion and redeposited sand. The light keepers house on the property has been converted into a very informative museum. One room is dedicated to pictures and a description of the 1999 move to the new location. Another room gives a lot of information about the submarine threat off this coast in the early 1940's during World War II. We never realized that during March and April of 1942, the German submarines were sinking about one merchant ship per day.!! Right off the coast of the Outer Banks. One submarine wreck was just recently discovered and reported on the national news this week. Heading away from the Outer Banks, Jan and I head over Route 64( not the interstate). 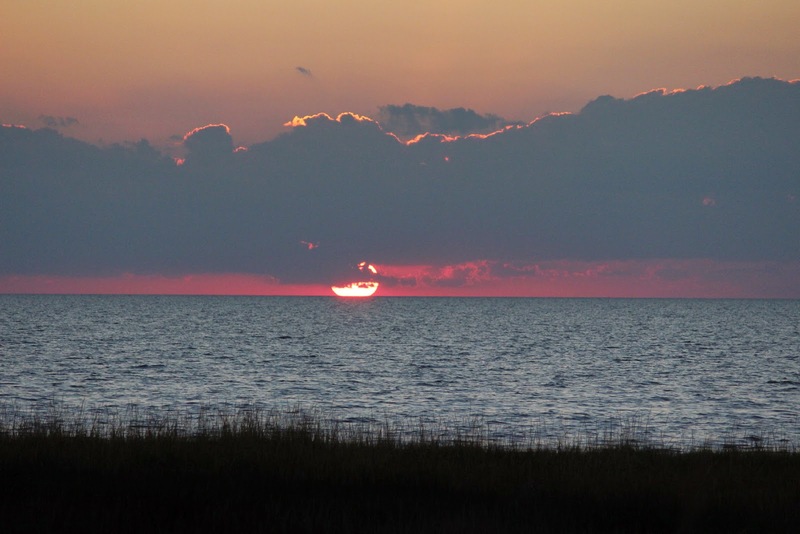 The first part takes us over Roanoke Island. 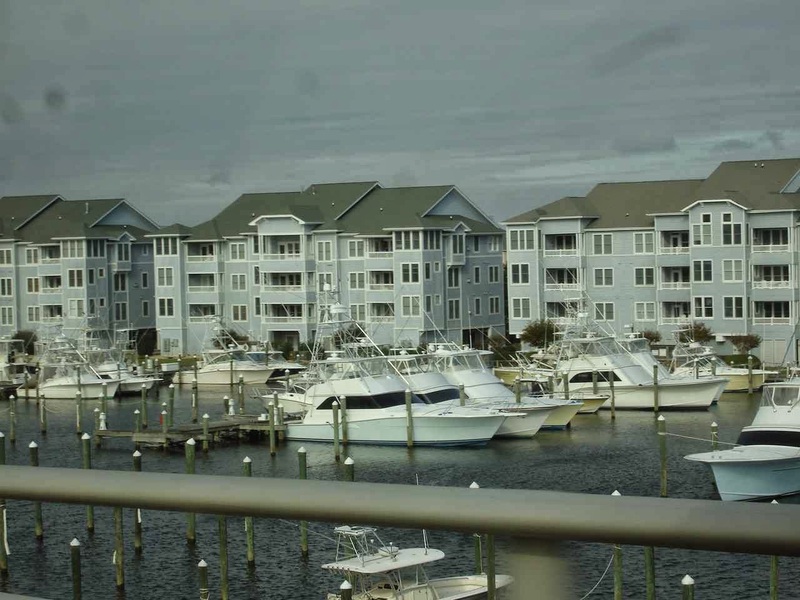 These condominium owners seem to have a pretty great place to dock their boats. State Route 64 follows the south side of Albermarle Sound and the Alligator River. This also includes the Intracoastal Waterway. This route takes us on some beautiful back roads as we head to our Corps of Engineer campground on the John Kerr Reservoir. Along the way , we can see lots of activity in the many fields. Lots and lots of cotton fields. Some being harvested and others already done. 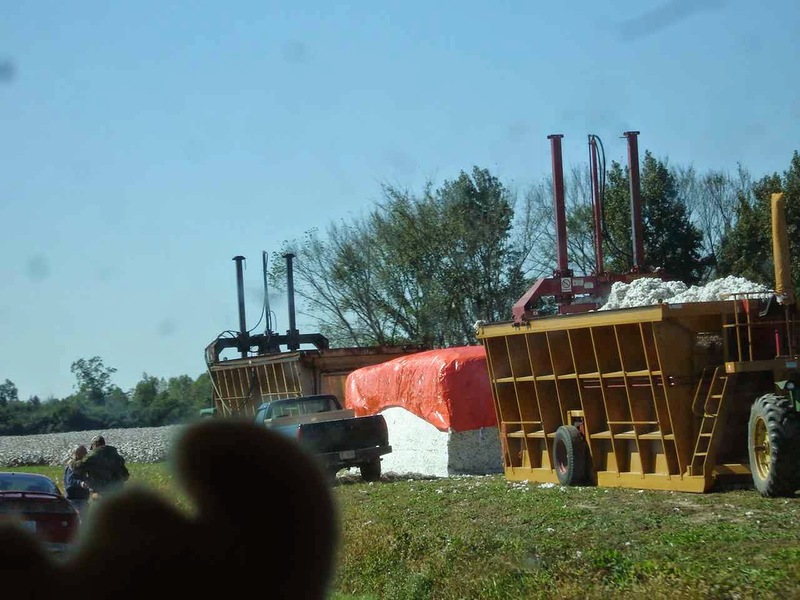 These are two trailers of harvested cotton which are being compressed into large bales like the one covered in red. We also passed fields of peanuts and large bins of harvested peanuts. Not to mention, strange looking fields of what looked like green sticks with a few small leaves. A local indicated that these were tobacco plants that had probably had most of the leaves harvested already. When you are on a two lane road with a trailer truck behind you and everyone going about 60mph, you better not slow down too much. Jan is great at taking the rolling side shots. 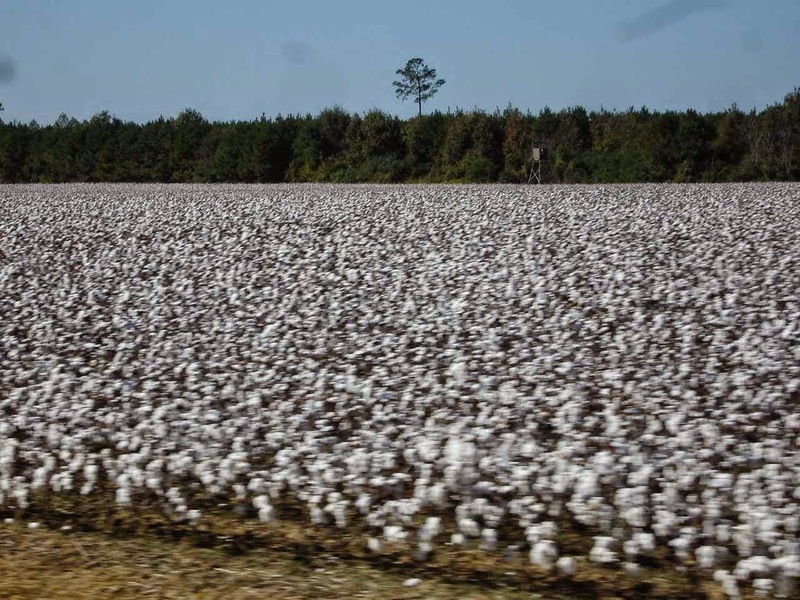 This is a small part of a large cotton field. The above illustrates the advantages of travel away from the interstates. Sometimes a bit more challenging, but often giving a much better idea of the area. 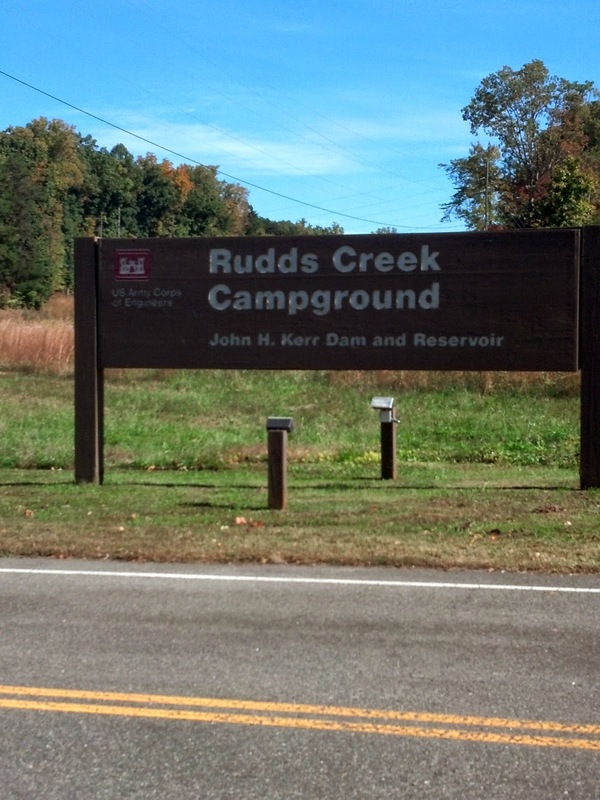 This leg of our adventure ends here at Rudds Creek COE Campground in Boydton, Virginia. This is close to the North Carolina and Virginia border , west of Routes 95 and 85. 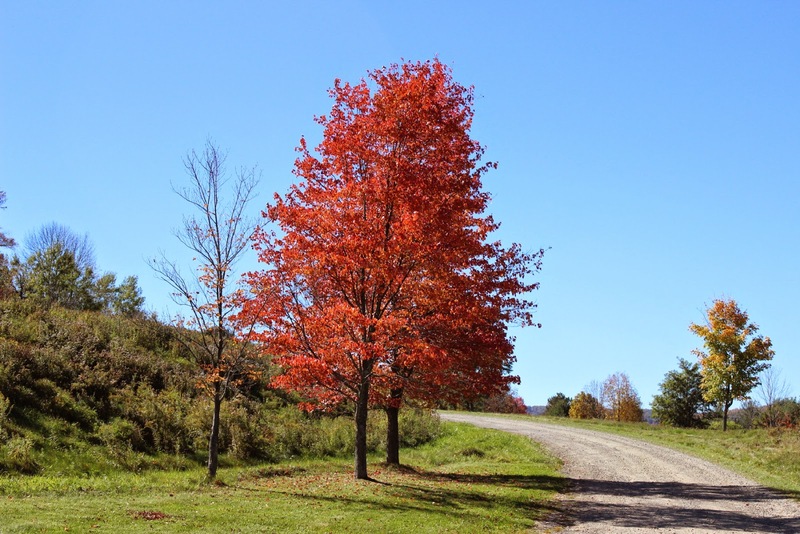 With heavy rain, Jan and I decided to spend a few extra days at Ives Run COE in Tioga, Pa. Good choice, because the day we left gave us great views of fall foliage through the mountains as we traveled down Route 15 towards Harrisburg. 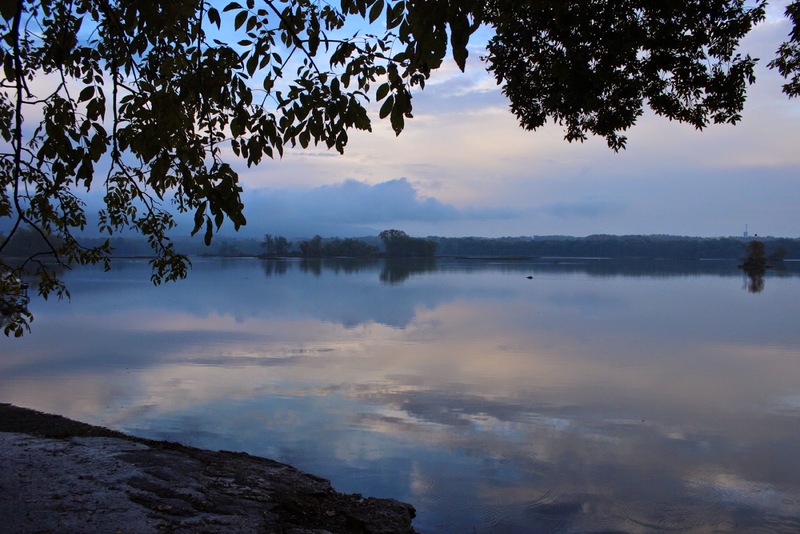 Route 15 joins up with the Susquehanna River and parallels it for a number of miles into Harrisburg. We decided to try Ferry Campsites right on the river. It is a Passport America campground which meant half price on a Thursday night. The sunset over the river offered some great views. We had been in this area six years ago, but further west on the Juniata River. Just had to go back and catch some pictures from that visit. 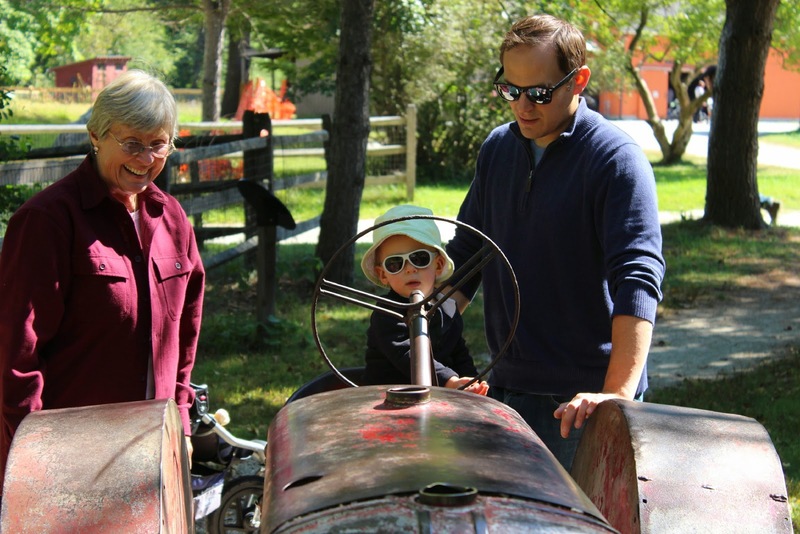 Besides a side trip to Hershey, Pa, we had happened upon an antique car show. There is something about cars from your past. 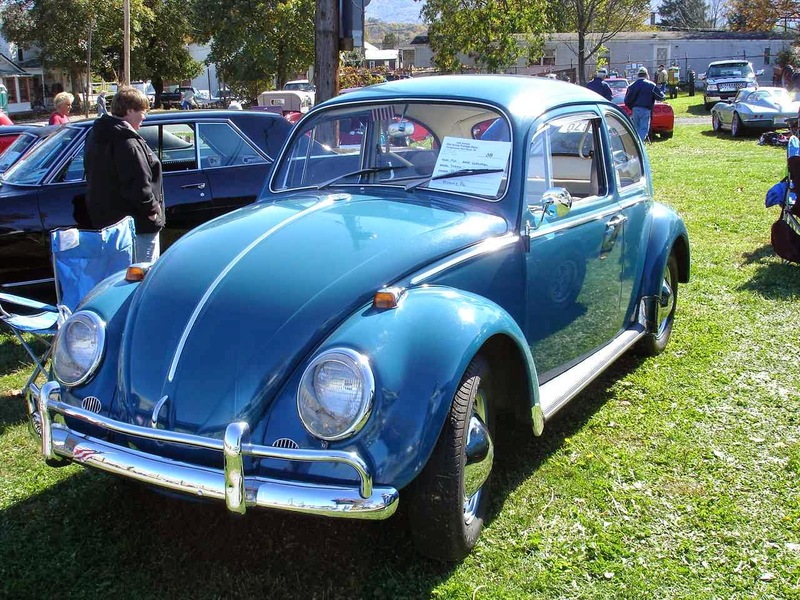 This is a 1963 VW bug. It had to be one of the most enjoyable , cheap drives at the time. Jan's Dad had one a little older than this with the manual flip lever for the reserve gas. Ours was a 1968 model, still a lot of fun. 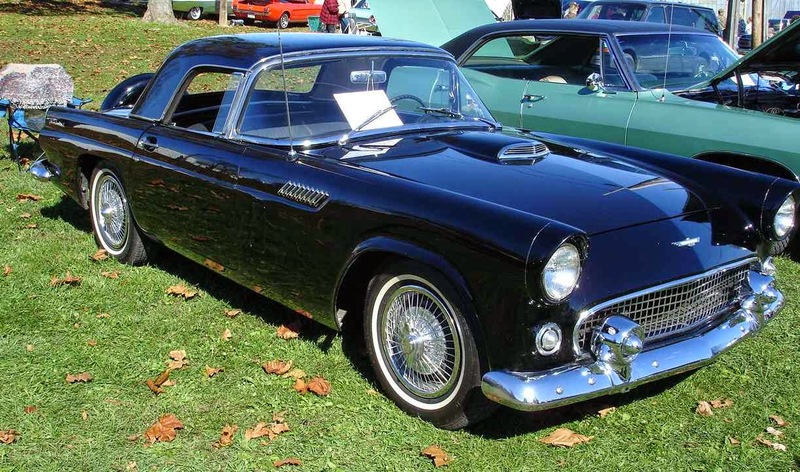 Also on show was a 1955 or 1956 Ford Thunderbird. Clifton had one almost like this one. Wish you still had it, Clifton? 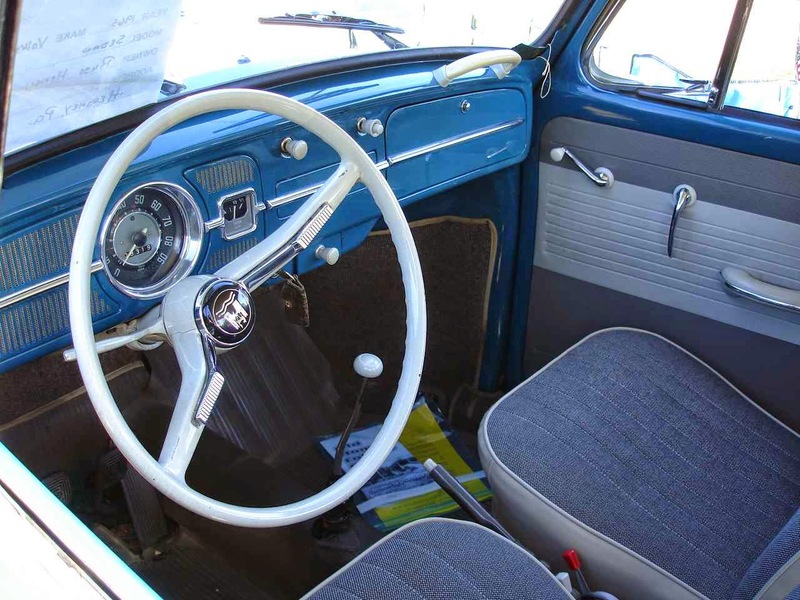 And I just could not end without one of the ultimate cars of our 1950's neighborhood. 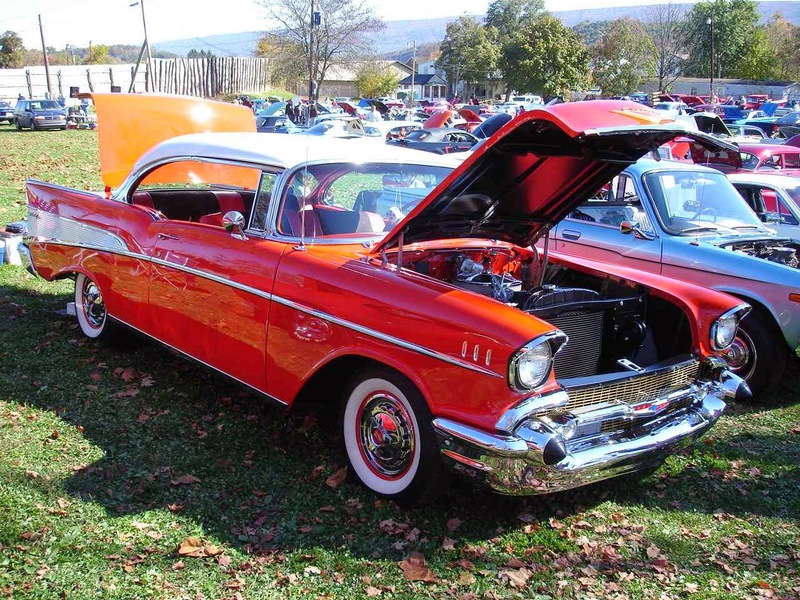 The 1957 Chevy was a classic for all time. Enough said! From the Susquehanna , it is quite a ride to head around Harrisburg and then east to Delaware. The idea is to avoid all of the congestion of Washington, D.C. and Baltimore. Well, we did avoid some of it by heading down Route 1 and then to the shore of Delaware and Henlopen State Park. 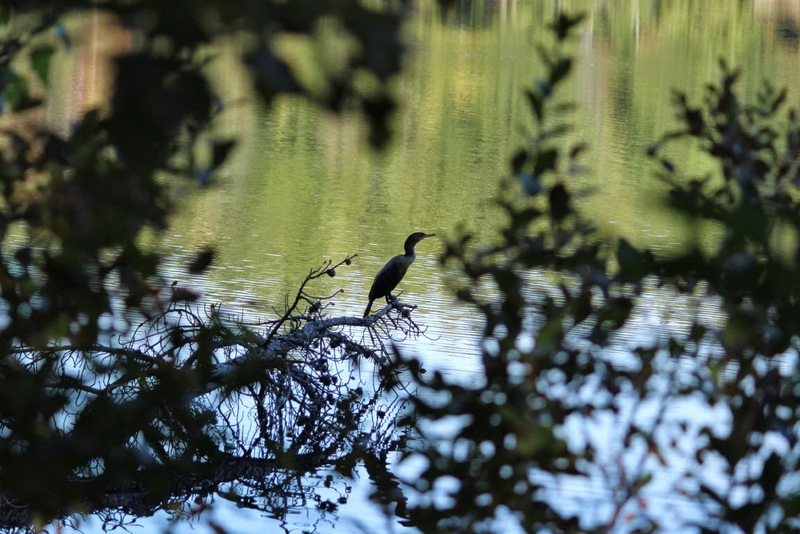 A beautiful park on the shore, it covers land once used by WWII installations used to keep track of enemy submarines and warships that might target war production faciliites in Wilmington. 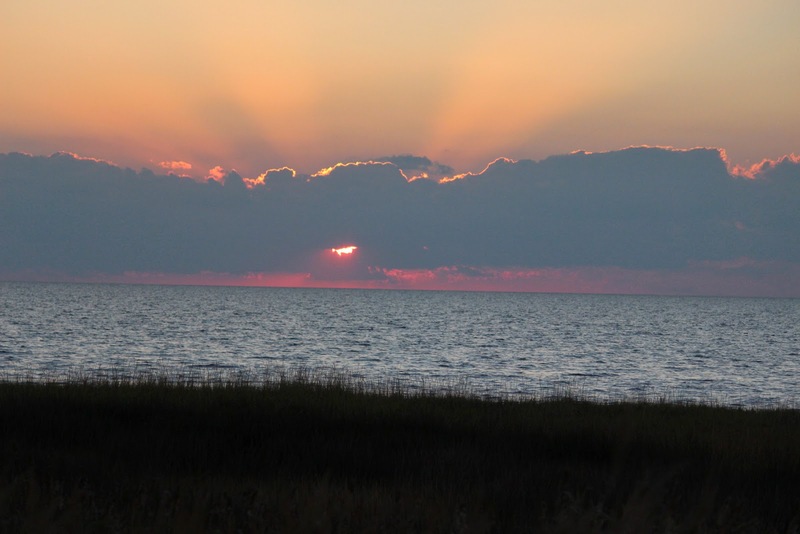 This park is on Cape Henlopen in Delaware and right across the river is Cape May in New Jersey. 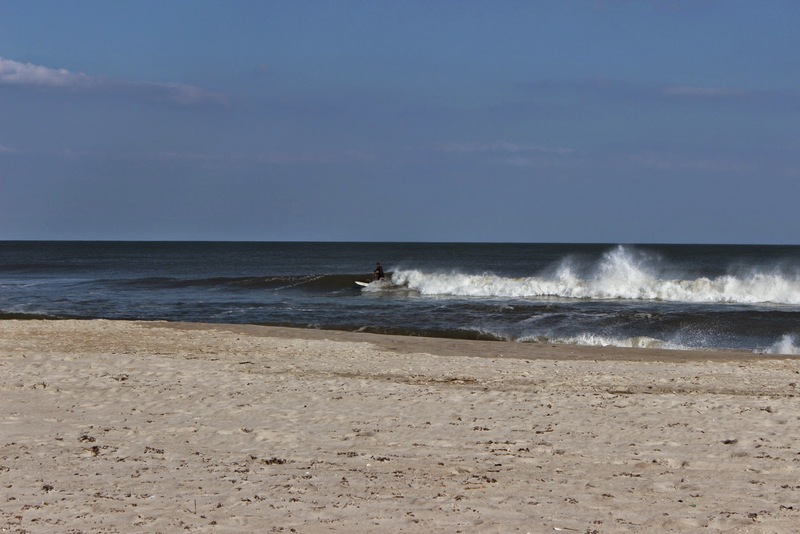 We could have come down the New Jersey shore to Cape May and then taken the ferry to Cape Henlopen. We did see some large Class A and Fifth Wheel Rvs in line to board the ferry north. 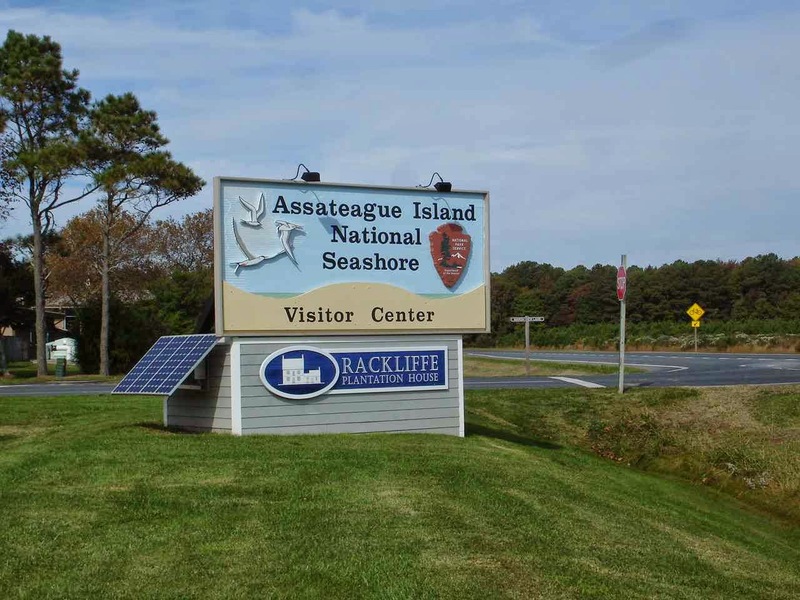 Our main reason to head to this area was Assateague Island National Seashore Island Info. 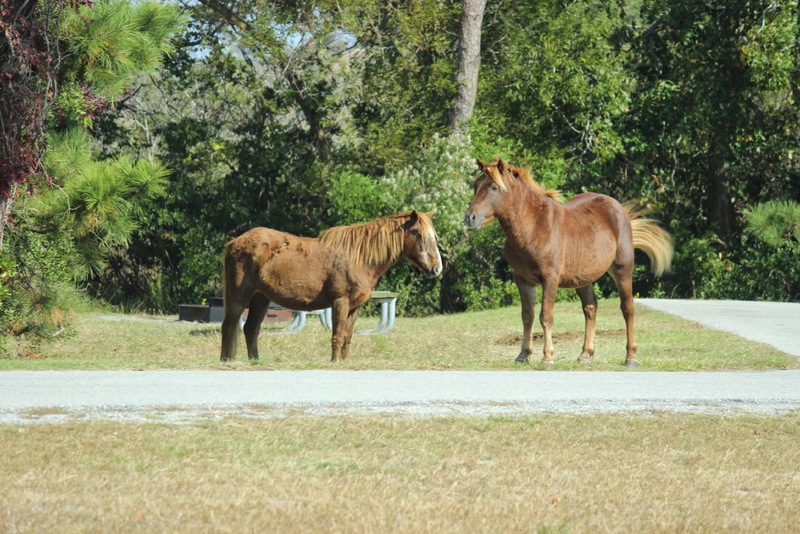 And one of the biggest draws for this park is the presence of wild horses. These pictures around our campsite are proof that the horses are very much there. It's not just horses. 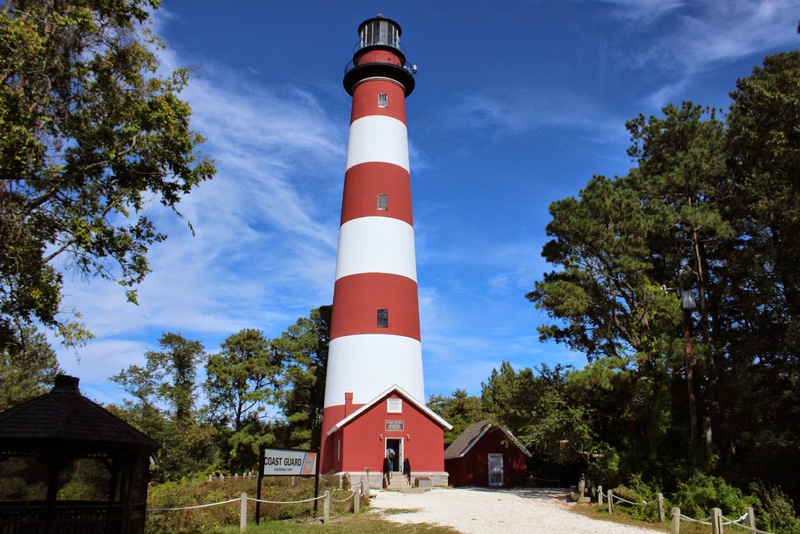 Assateague is a draw for beach goers, surfers, fishermen, and wildlife watchers. Just to give you an idea of the popularity, we were lucky to get a camping spot here on a Saturday. The sign going in said "Campground Full" Luckily, we try to ignore such signs and check for ourselves. The park is well kept and plenty of rangers and hosts working to keep it maintained. 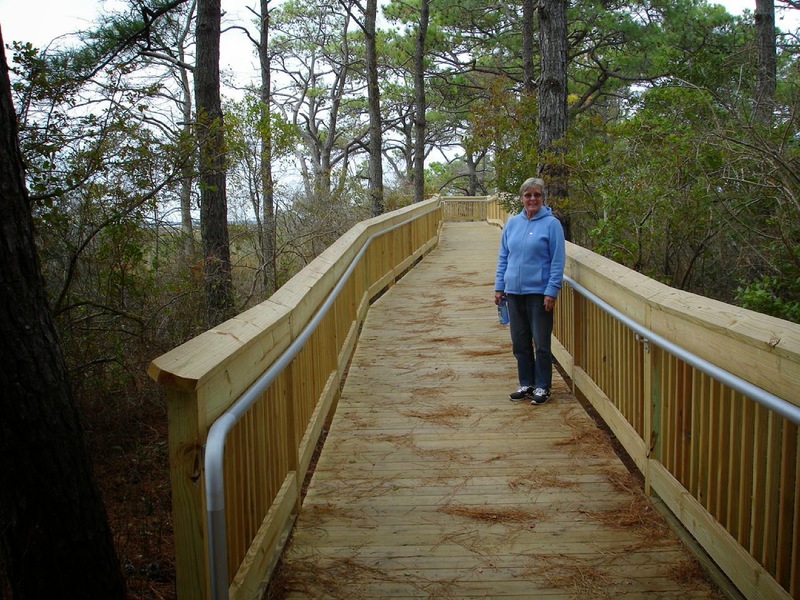 This long walkway was recently replaced and provides a great views over the water on bayside. If you plan to visit, keep in mind that there are no hookups at this campground. 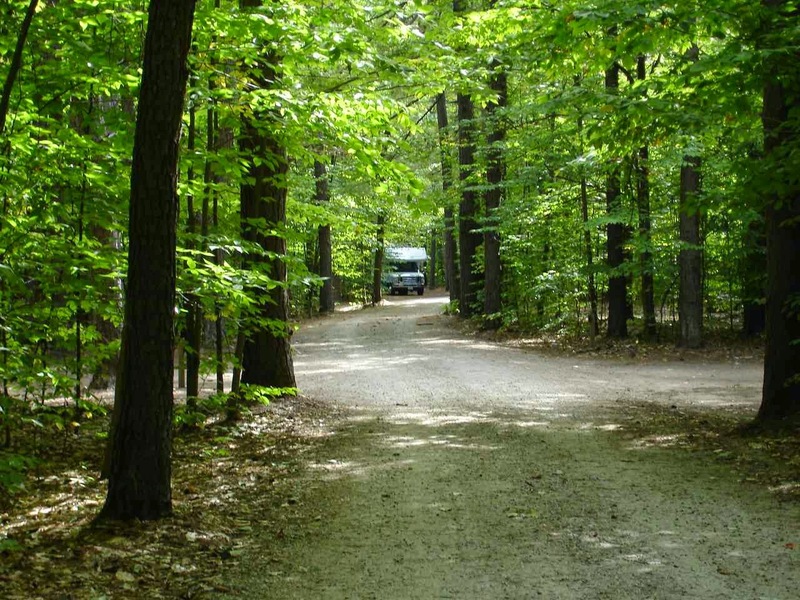 There is fresh water and a dump station within the campground. For us, the solar panels came in handy once more and, of course, the entrance was free and the nightly cost was $10 with our senior pass. Keep in mind that you can be in the wilderness here on the island and just a few miles north is a very busy tourist mecca called Ocean City. But you will have no problem finding a crabshack for dinner. This picture was taken from our back window. The stallion was keeping track of three mares, but they were close by our RV most of the two days. 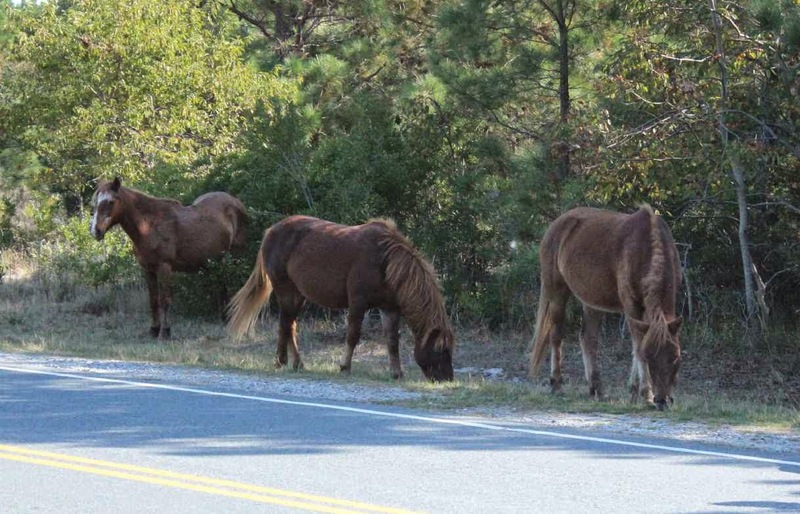 For those of you who are more familiar with horses, the rangers indicated that these horses may look a little bloated because they are always eating salty vegetation(including poison ivy!!) and for that reason, drink a lot of water. You can see that they are starting to get their winter coats. The New England visit goes by way too quickly. It seems like it was just July and we were arriving and now it is October and we are heading south. 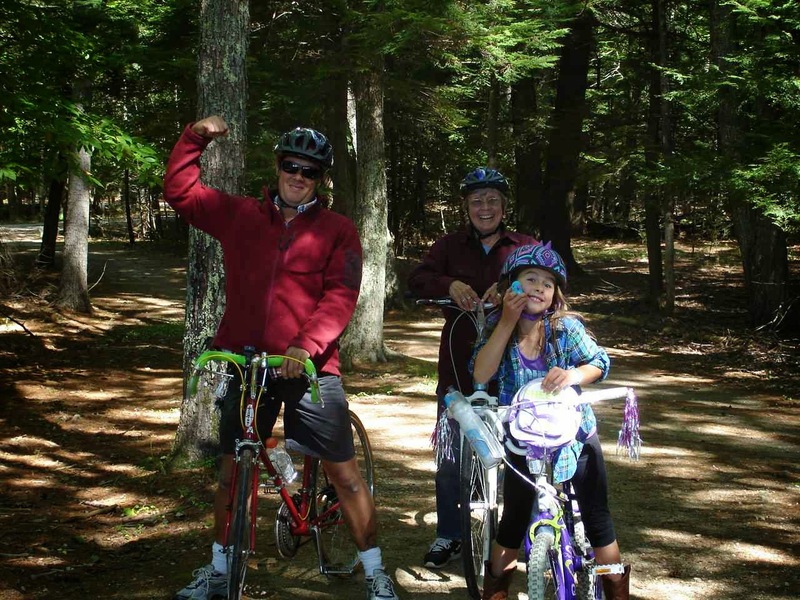 This was a great bike ride with Sean and Madison all around the Sebago Lake State Park Camgrounds and the Day Use Area. With a little help from Madison's talking bird. A small cabin in the Day Use Area seems perfect for a playhouse. A necessary part of the ride is a stop at the Songo Locks. 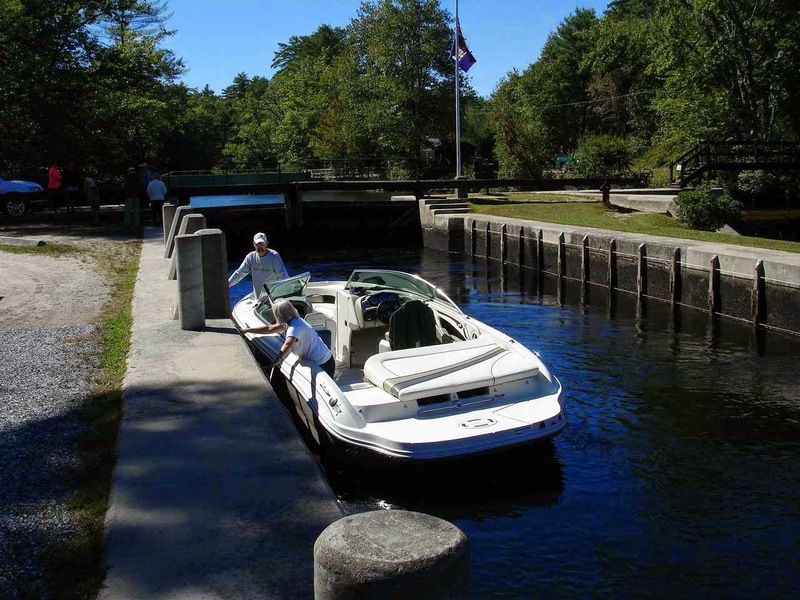 Only one boat this time, but all hands were put to use in opening and closing the lock gates. Part of our research this trip was to find a campground or two that we might be happy in for longer than a week or so. We found two. One was in Alfred, Maine and the other was in Hampton Falls, New Hampshire. 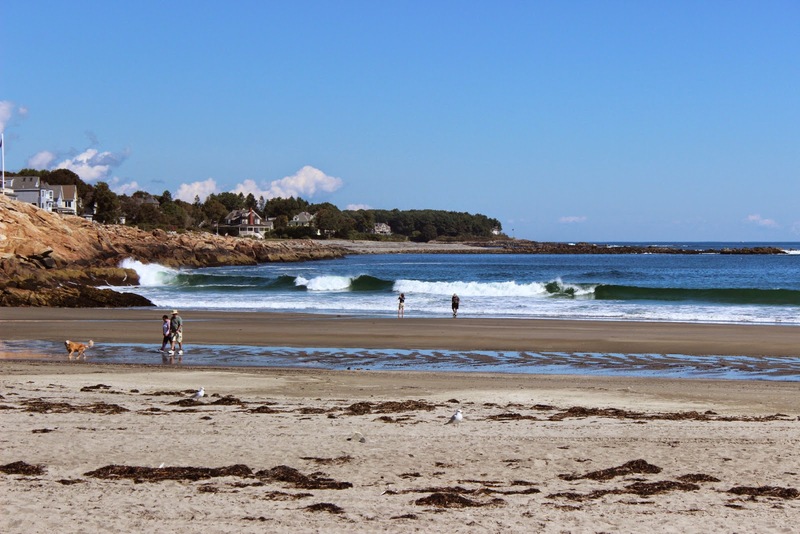 The nice thing about Alfred is that it is close to a lot of Maine that we enjoy. This picture is of York Beach Short Sands. 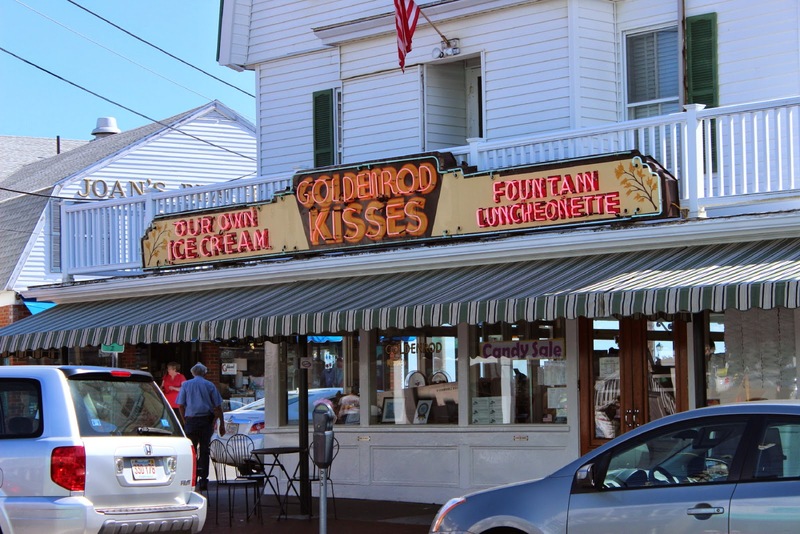 Short Sands is the location of that other icon, The Goldenrod, home of famous Goldenrod salt water taffy made at the window for all to see. 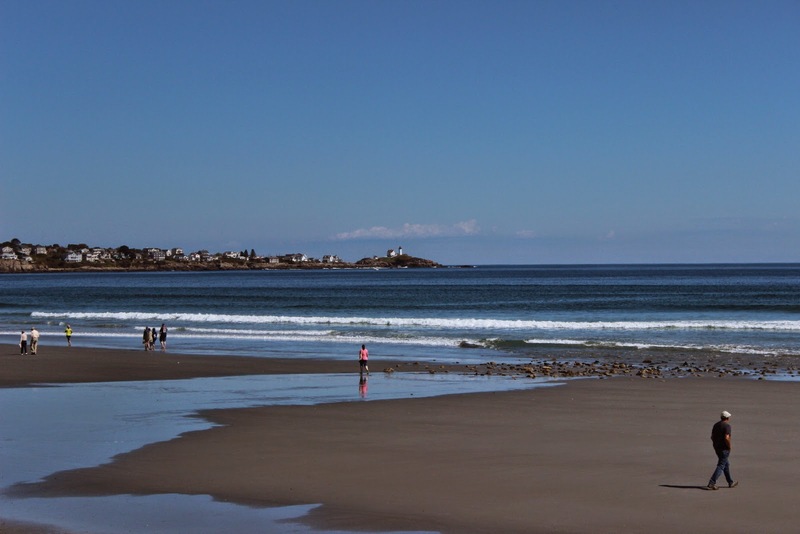 Long Sands York Beach is best known by the wonderful views of the ocean and Nubble Light. Our family learned how to body surf the waves here back in the 1950's. Of course, that was after your ankles stopped being so numb from the ice cold water. 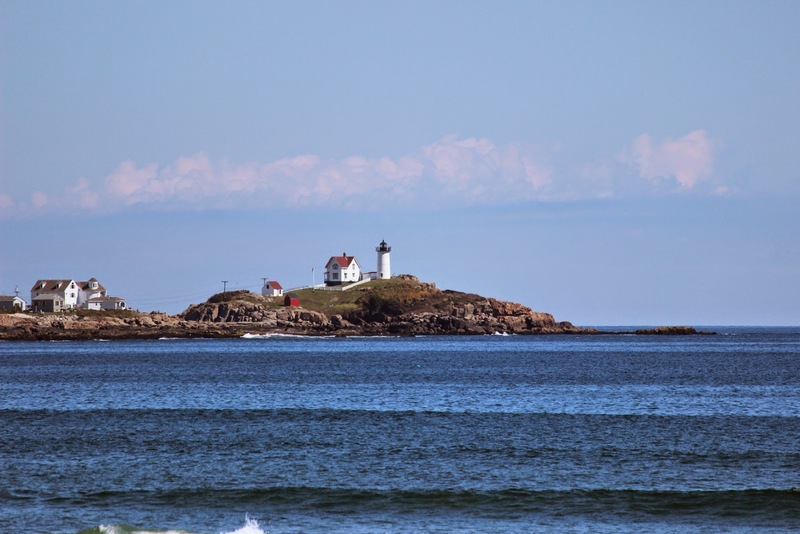 Most views of Nubble Light are much closer, like this. Luckily , we had another chance to visit with Lucas, Rachel, and Scott. 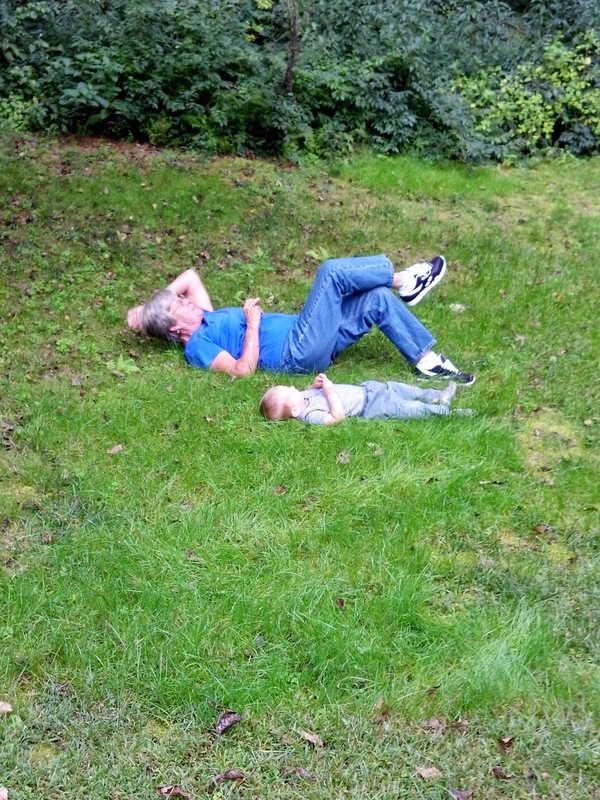 Lucas and Grandma are checking out the clouds. It had been a long time, but it was good to visit Drumlin Farm Wildlife Sanctuary, a part of Massachusetts Audubon. 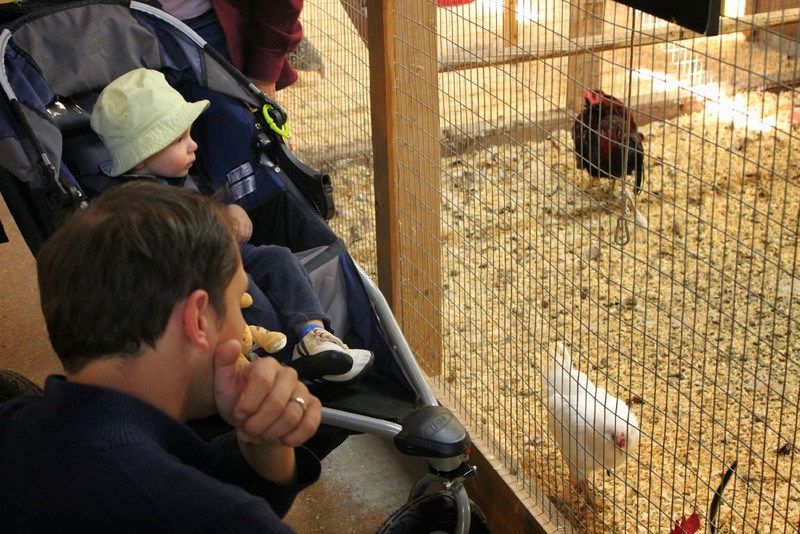 Lucas loves the chickens and the wild birds. So Lucas, we know cousin Emilie is now driving, but we think, maybe, you might wait for a few more years. 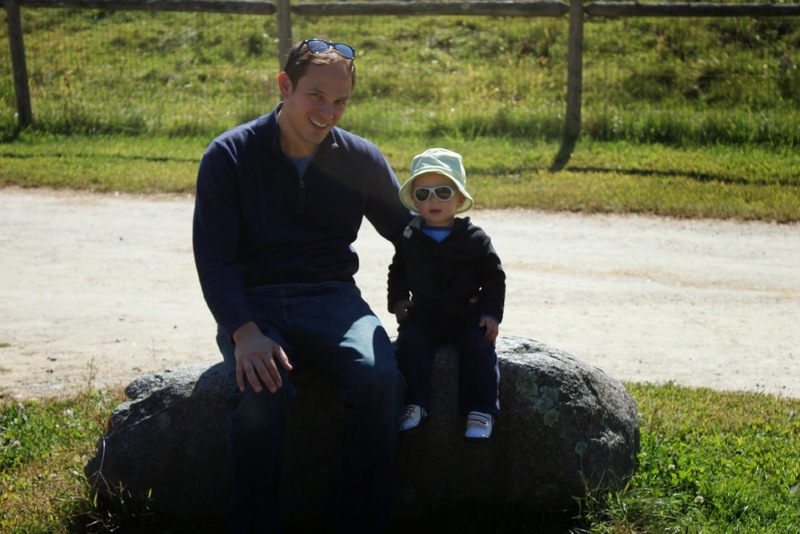 Sometimes, at a big place like Drumlin Farm, you need to take a break. 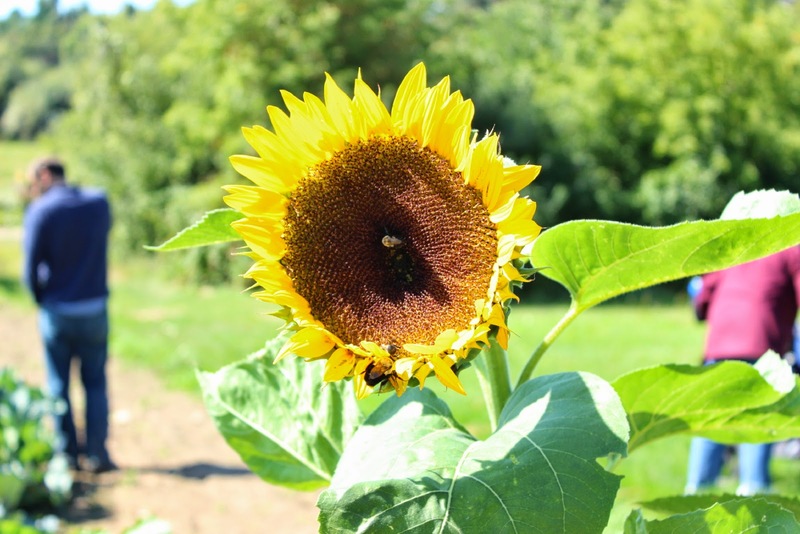 A good section of Drumlin Farm is dedicated to large fields of all kinds of vegetables and flowers. This is part of CSA or Community Sponsored Agriculture which we mentioned from our last visit with Scott and Rachel. What is Community Sponsored Agriculture. 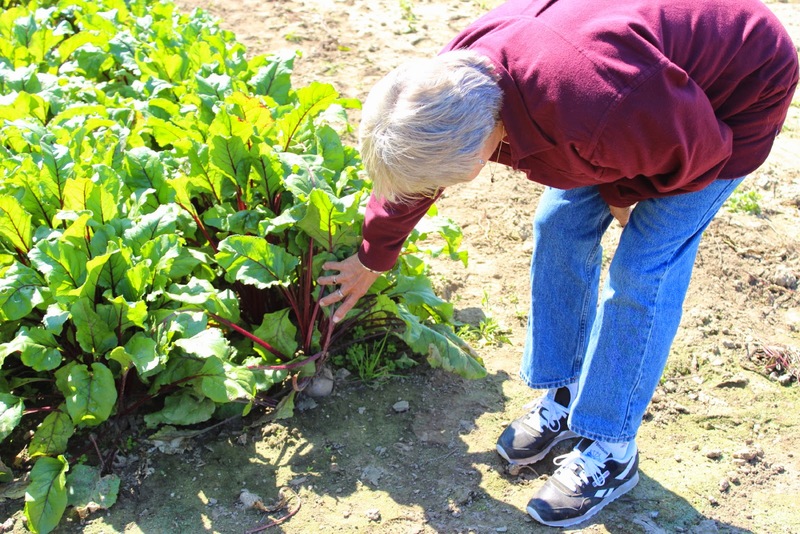 Jan is checking the size of these wonderful looking beets. There is something about Sunflowers. We had many choices of places to visit in New England. Vermont was one that did not happen this year. 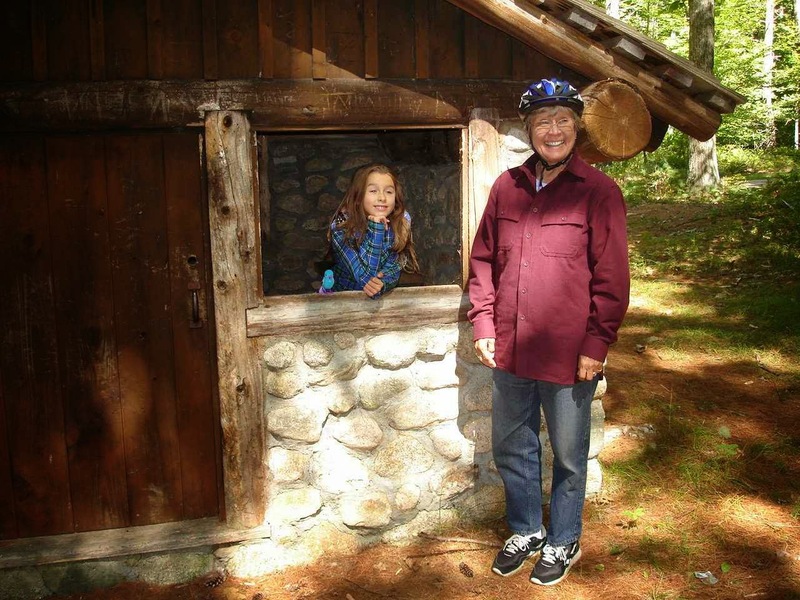 But, we did visit three New Hampshire state parks. 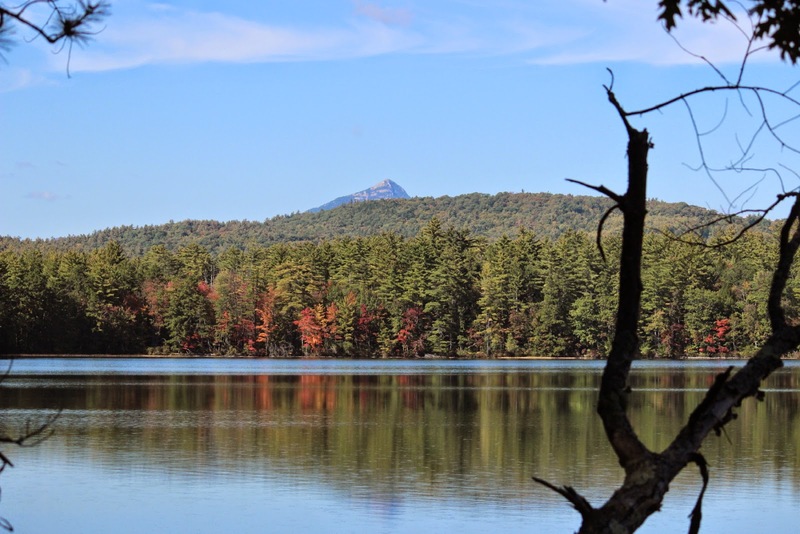 The first was Pawtuckaway State Park off Route 101 in Raymond, New Hampshire. 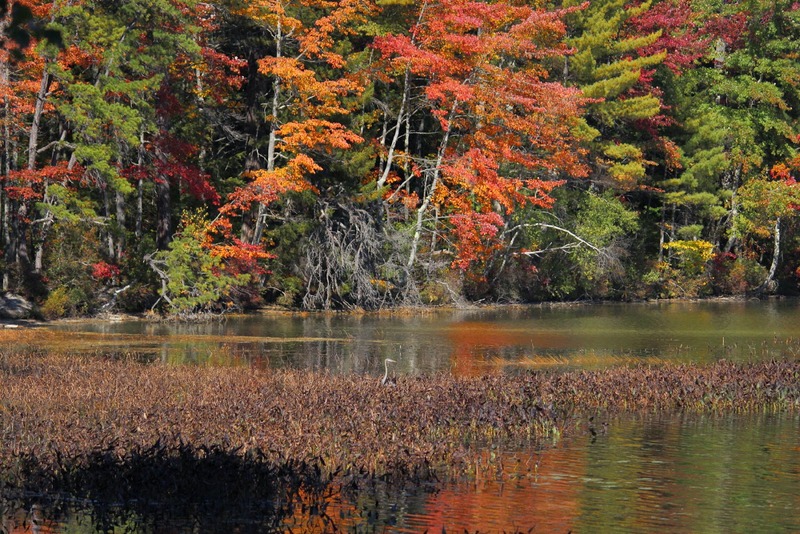 Pawtuckaway State Park Pictures and Videos. The above link had great pictures and video links when you scroll down to the bottom of the linked page. 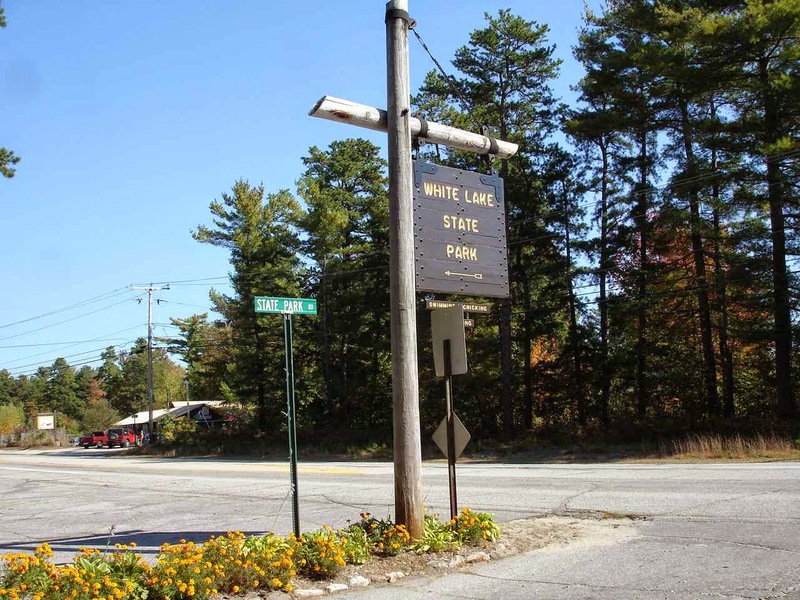 After Pawtuckaway we head up back roads to Lake Winnipesaukee. We are close to Alton Bay on Route 11 for this first view above of the lake. 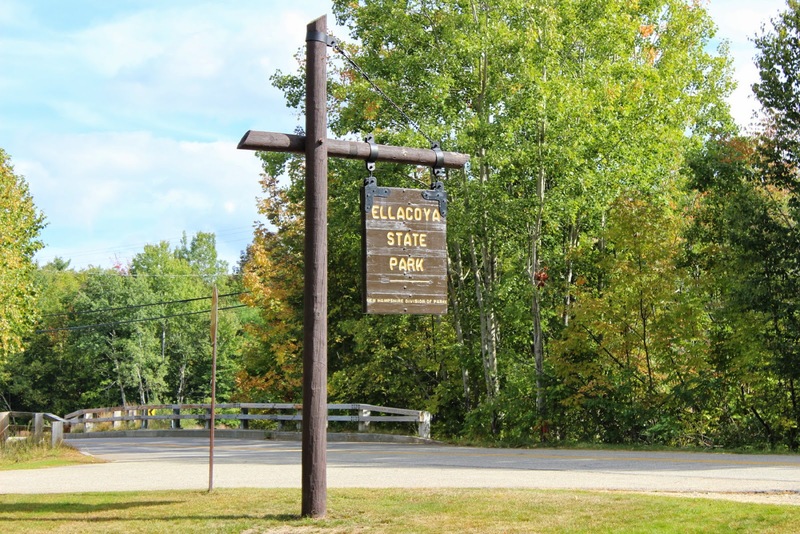 Jan and I are a little surprised to find Ellacoya State Park. 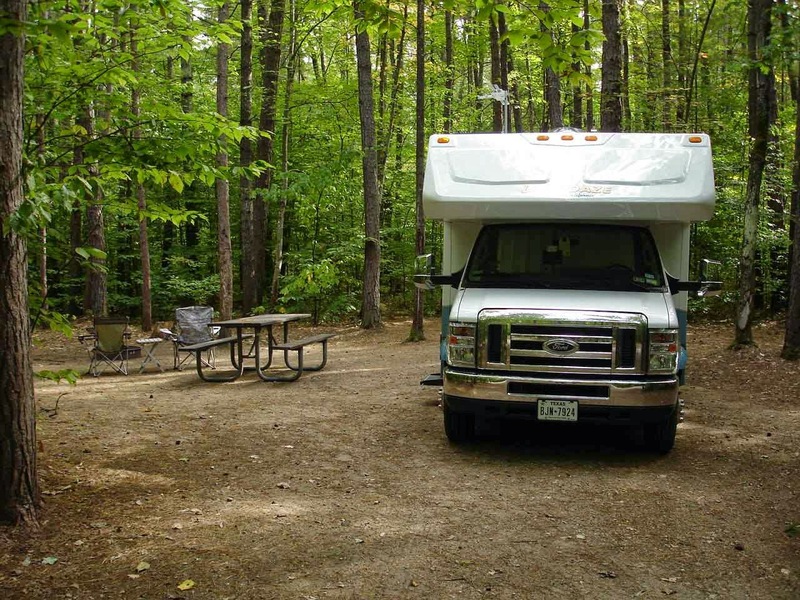 It is a small campground with full hookup sites directly on Lake Winnipesaukee. 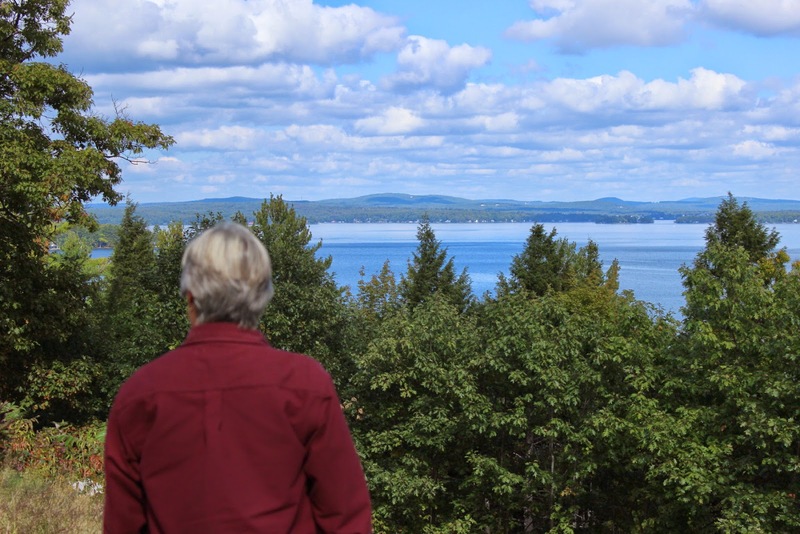 No crowds in September and we can have a wonderful view of the lake right from Lady Blue. Mountains in the background and the M/S Mount Washington boat that cruises the lake. This link will give you all you need to know about the cruises on the lake. 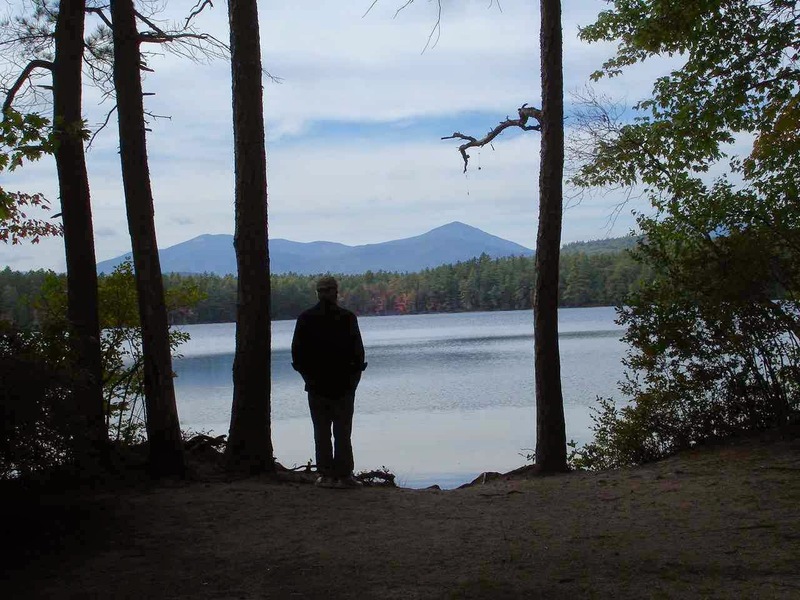 Following the west shore of Winnipesaukee up route 25 to Route 16, we come to a hidden gem of New Hampshire. White Lake State Park. Quite busy in the summer, it is very accessible and quiet in the fall. Jan and I find a nice site surrounded by absolutely no one. A large site with room for many more people and probably another couple of tents. No senior card here. This campground was $25 per night, but that still beats the $40 to $60 fees at the private campgrounds. You can see all the crowds around Lady Blue. There is a trail all the way around the lake. 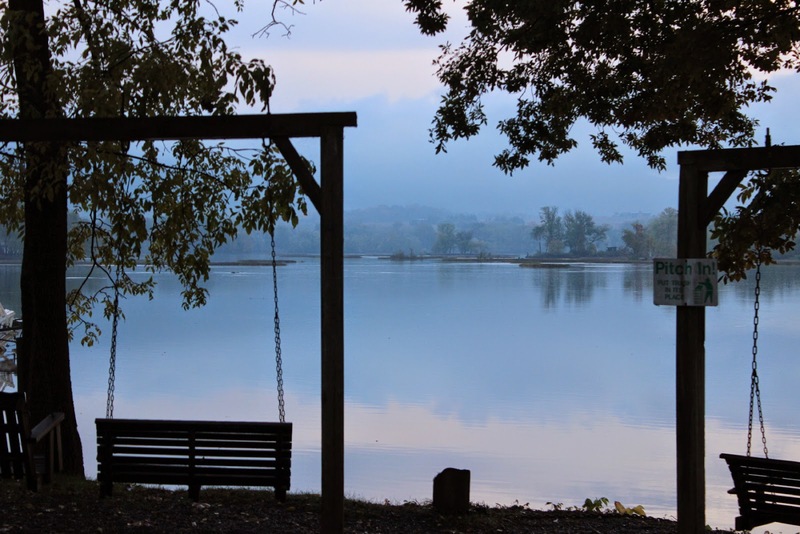 We notice right away that there are no private buildings around the lake. This is all state park property. 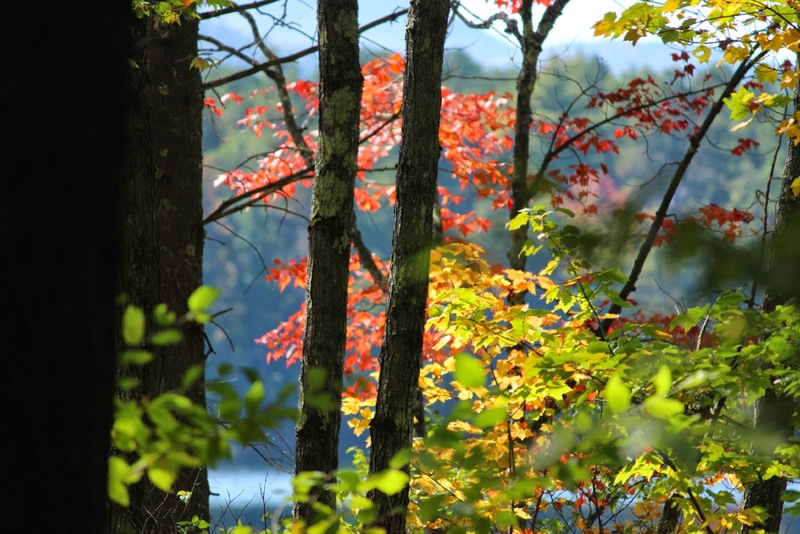 The foliage is just beginning to change. Some wonderful views are to be had on the trail. Jan was worried about a black bear that was sighted in the campground right before we began our hike. 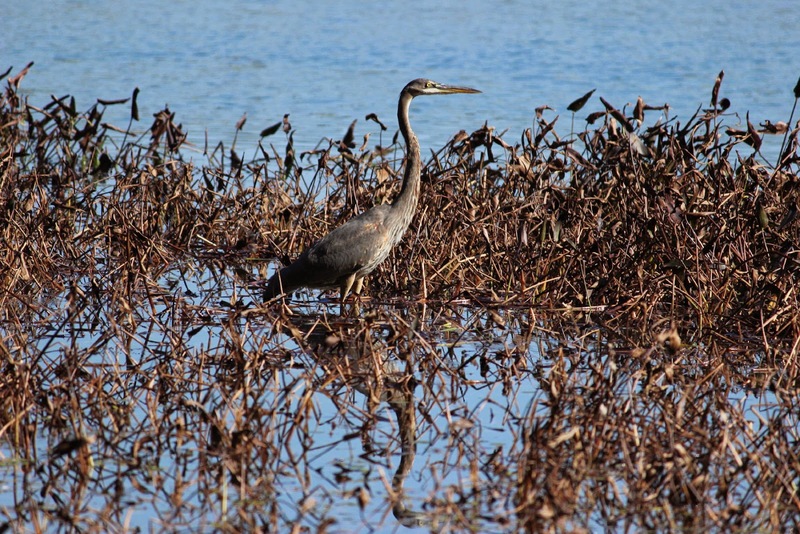 Much more likely for us was the Blue Heron in the weeds. Perfect in the fall colors with just a hint of reflected color in the water. A handsome fellow closer up. Leaving New Hampshire, we still have time to visit with friends and family. But, before a blink of the eye, it seems, we are on our way south. 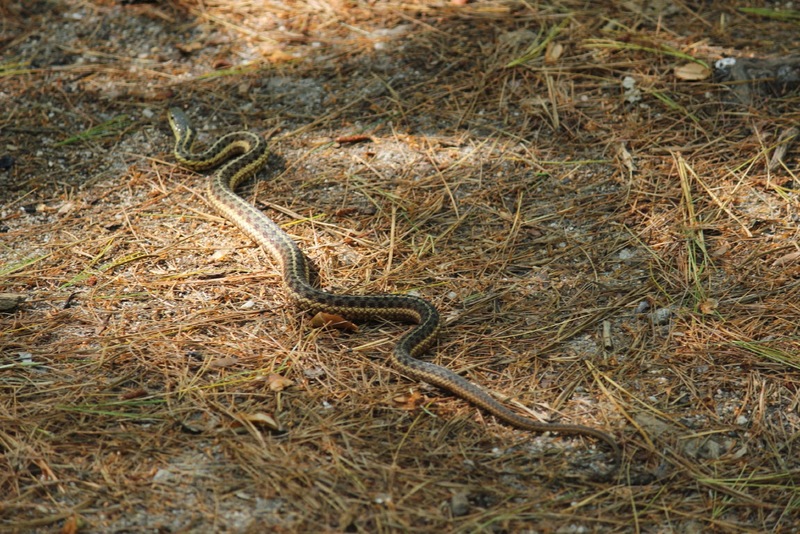 This little guy was enjoying the sun right outside our campsite. About 3 feet long or so. To make plans for our journey west, a visit first to Ives Run Corps of Engineer park in Tioga, Pennsylvania. 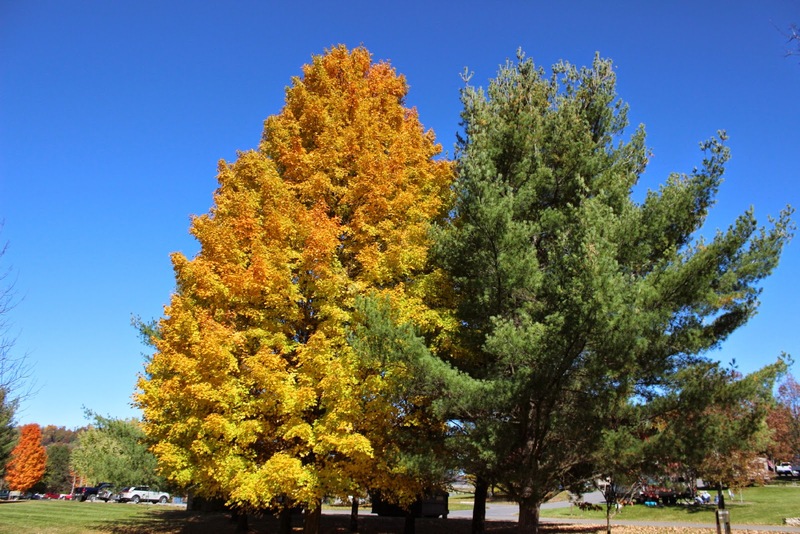 Some wonderful colors to be seen along the route and in the park itself. Also, some great glimpses of a local eagle that likes to hunt over the lake. Meanwhile, we are looking forward to next summer. What a great country! !